The Fimap My16 B scrubber drier is recommended for cleaning the floor of small, cluttered areas up to 1,300 sq.m. 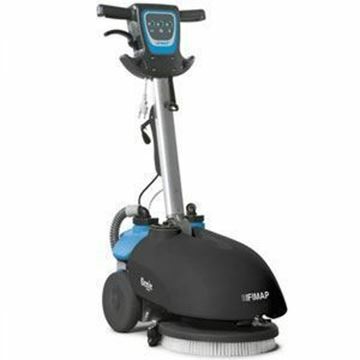 It's a particularly compact and easy-to-handle scrubber dryer that moves easily over reduced surfaces such as small garages, electrical repair shops, tyre centres, mechanical workshops, professional studios and shops. The MY16B has no problem cleaning well into the corners and up to the walls. For those who carry out the end-of-day maintenance cleaning operations, MY16B can help keep your floor perfectly clean and sanitised in just over an hour.